The Artek youth camp was created in 1925. During the Second World War the peninsula was invaded by Nazi Germany and Romanian troops in summer 1941 across the Isthmus of Perekop. Following the capture of Sevastopol on 4 July 1942, Crimea was occupied until German and Romanian forces were expelled in an offensive by Soviet forces ending in May 1944. The Nazis murdered around 40,000 Crimean Jews. On 25 June 1946, it was downgraded to the Crimean Oblast, and the Crimean Tatars were deported for alleged collaboration with the Nazi forces. A total of more than 230,000 people – about a fifth of the total population of the Crimean Peninsula at that time – were deported, mainly to Uzbekistan. 14,300 Greeks, 12,075 Bulgarians, and about 10,000 Armenians were also expelled. 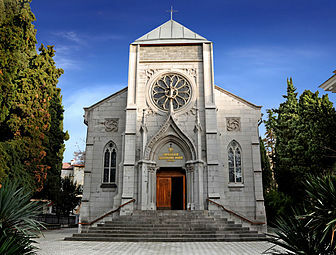 Simferopol is a city on the Crimean Peninsula which is, since the 2014 annexation of Crimea by the Russian Federation, the de facto capital city of the Republic of Crimea within the Russian Federation. 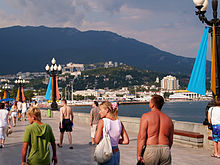 De jure, it remains the capital city of the Autonomous Republic of Crimea within Ukraine. 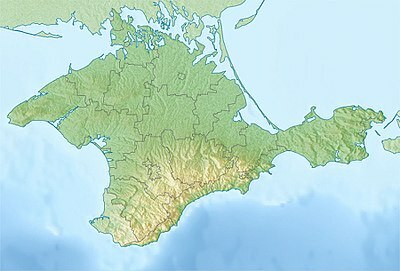 The status of Crimea is disputed between Russia and Ukraine as a result of the 2014 vote to join Russia, which was held during Russian military intervention, and the subsequent annexation. Simferopol is an important political, economic and transport hub of the peninsula, and serves as the administrative centre of both Simferopol Municipality and Simferopol District, though it does not belong to the district. Population: 332,317 . 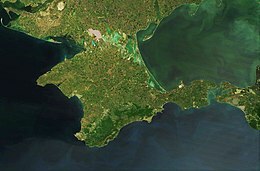 The Isthmus of Perekop is the narrow, 5–7 kilometres (3.1–4.3 mi) wide strip of land that connects the Crimean Peninsula to the mainland of Ukraine. 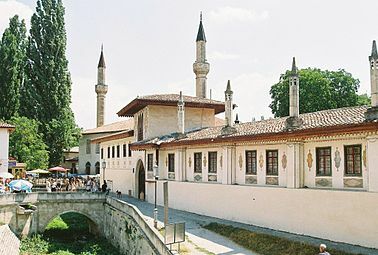 The isthmus is located between the Black Sea to the west and the Sivash to the east. 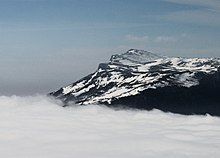 The isthmus takes its name of Perekop from the Tatar fortress of Or Qapi. 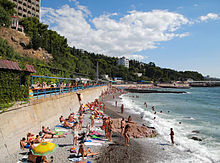 Alupka is a resort city located in the Crimean peninsula, currently subject to a territorial dispute between the Russian Federation and Ukraine. 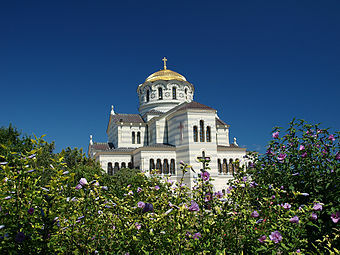 It is located 17 km (11 mi) to the west of Yalta. 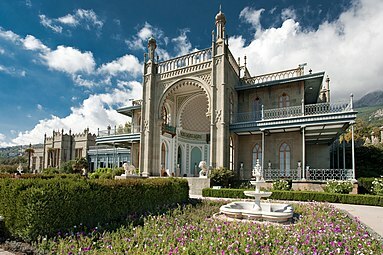 It is famous for the Vorontsov Palace, designed by English architect Edward Blore in an extravagant mixture of Scottish baronial and Neo-Moorish styles and built in 1828–1846 for prince Mikhail Semyonovich Vorontsov. Population: 7,771 . Sister-city: Apopka, Florida, USA. 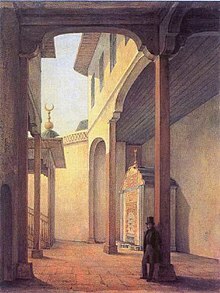 The Taurida Governorate or the Government of Taurida was an historical governorate of the Russian Empire. 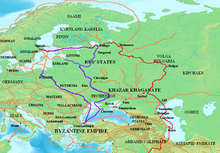 It included the Crimean Peninsula and the mainland between the lower Dnieper River and the coasts of the Black Sea and Sea of Azov. It was formed after the Taurida Oblast was abolished in 1802 in the course of Paul I's administrative reform of the South-Western territories that had been annexed from the Crimean Khanate. 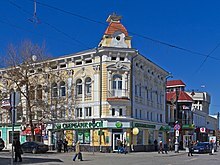 The governorate's centre was the city of Simferopol. 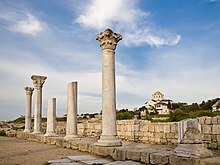 The province was named after the ancient Greek name of Crimea - Taurida. 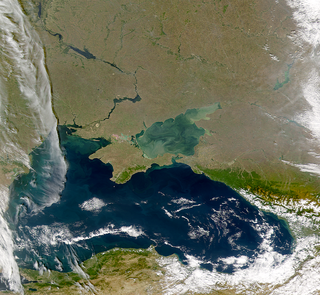 The North Crimean Canal is a land improvement canal for irrigation and watering of Kherson Oblast in southern Ukraine, and the Crimean Peninsula. 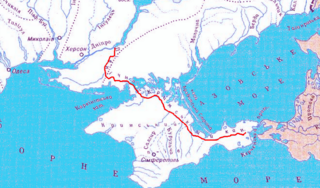 The canal also has multiple branches throughout Kherson Oblast and the Crimean Peninsula. 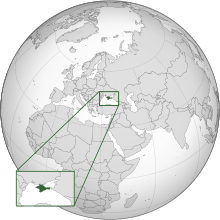 Oreanda is an urban-type settlement in the Yalta Municipality of the Autonomous Republic of Crimea, a territory recognized by a majority of countries as part of Ukraine and annexed by Russia as the Republic of Crimea. 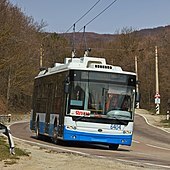 Kuibysheve is a rural settlement in the Yalta Municipality of the Autonomous Republic of Crimea, a territory recognized by a majority of countries as part of Ukraine and annexed by Russia as the Republic of Crimea. 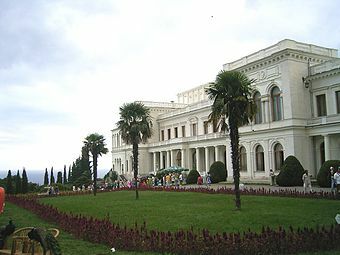 Vysokohirne is a rural settlement in the Yalta Municipality of the Autonomous Republic of Crimea, a territory recognized by a majority of countries as part of Ukraine and annexed by Russia as the Republic of Crimea. The Crimea Railway is a railroad located in Crimea, providing passenger and freight services to Sevastopol and the Republic of Crimea.